After seeing Degoose’s board, its image never goes away in my memory. I’ve been determined to weave it and finally finish it successfully. Before starting, I tuned up my planer, joiner, miter saw and table saw and emptied dust bags. Since all machines are set correct, everything was going smooth until the final assembly. 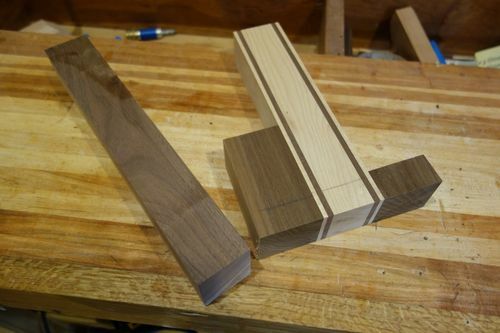 I think I clamped one side too strong, so had to cut one face slightly before gluing. Also I used biscuit to reinforce it, so the assembly took a whole day. It’s a fun project, I may try other wood combination like purple, red, or real black next time. Size: 9×11 blocks, each block is 2”, so 18” x 22” x 1.5”, it’s heavy. Following is the procedures roughly I remembers. Before cutting, I changed planer blades, bought new Forrest II table saw blade, replace jointer blades, tuned miter saw angle, and changed drum sander belt for best performance. So the preparation took quite a while. Board consists of 3 major sections. 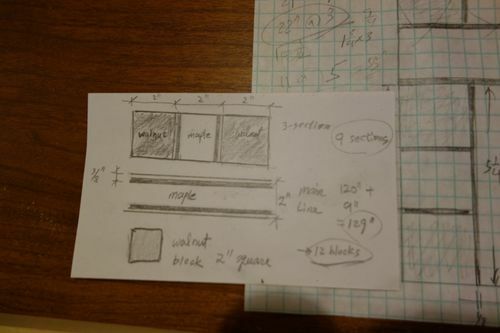 Use long piece of walnut lumber on both sides of maple, and make 3-section piece. Some people omit this process and directly glue all blocks. But I take rather easier way. Now start gluing. 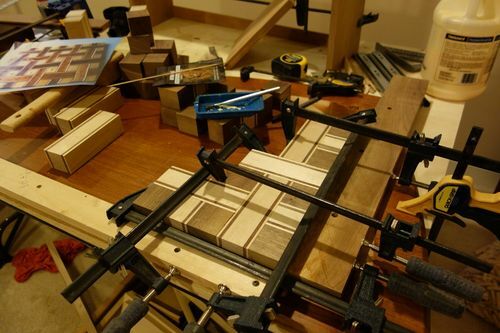 Set up right angle and prepare lots of clamps. did not hurry, take time. Fortunately, this shape you don’t have to glue all at the same time. Also, I inserted biscuits to reinforce the board when end grain meed with flat grain. However, this might be an overkill. Without biscuits, it’s still strong enough. tearing out or burning the belt. This board has a pattern, so size can be controlled only by the block size or have to add more rows. I know DeGoose is the chair person, but I did not check his procedures in making this board. I think it’s basically same and there wouldn’t be much difference. 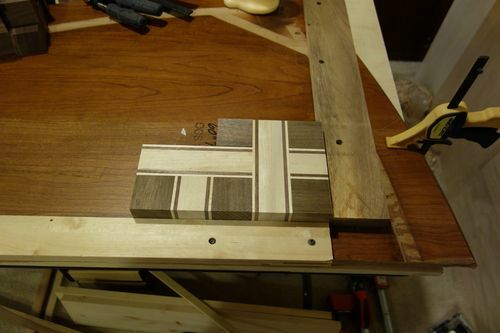 I use drum sander to control the exact size. 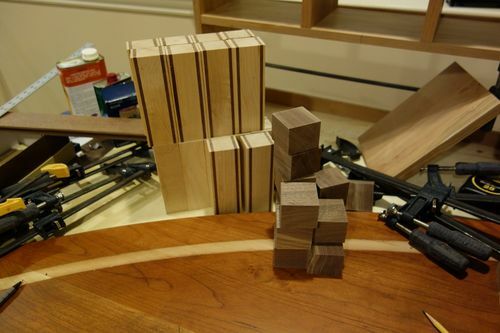 After making 2” members, let them go through the drum sander then all the blocks become identical, which is critical in this project. That’s a great looking board. You rarely see this style that thick! You should be very proud of this one! Holy cow! That must have been an awful lot of gluing up. 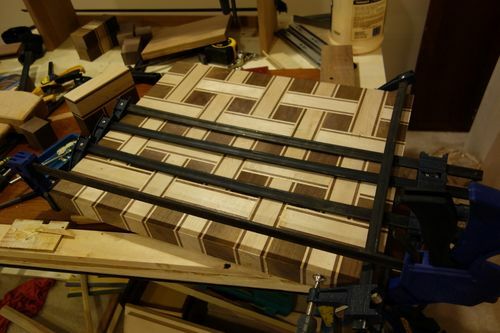 How long did all the glue up take you? You nailed it! Great looking board…. Northwest29/ gluing is a real challenge. It took a whole day. I made one mistake but fortunately I had enough extra. Jim/ It’s been on my list for a long time too. Very long time, many years and finally made it. Love it – very classy. Would you share the dimensions with us? OldWrangler/ before I start this project, I think about the technique may need. The conclusion is cutting the block exactly same is the key. That requires well-tuned machines. I purchased Forrest II saw blade, new planer blade and jointer blades, and reset miter saw blade, change drum sander… virtually revamped all my shop tools. After this thorough preparation, I could be able to cut all blocks exactly same and long blocks made same height and length. 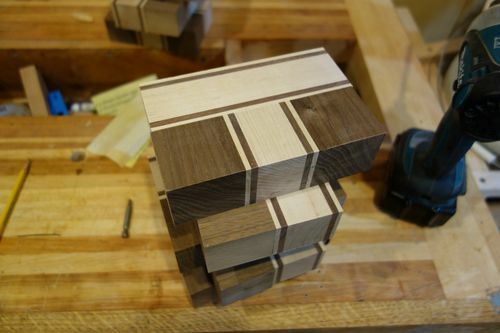 As long as I cut the blocks exactly same, gluing was relatively easier for me. Because it does not have to be done all at the same time. I can take a break any time during the work. Nice work. Really does have that convincing weaved look.